This microscopic image, taken at the outcrop region dubbed "Berry Bowl" near the Mars Exploration Rover Opportunity's landing site, shows the sphere-like grains or "blueberries" that fill Berry Bowl. 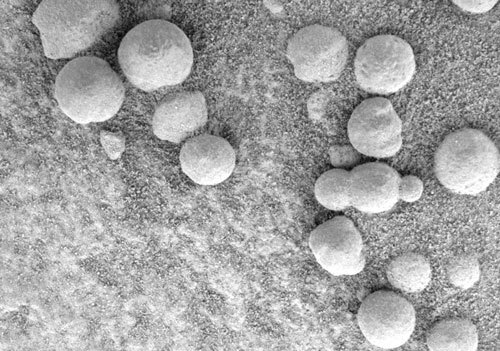 "The question is whether this will be part of a still larger story," Knoll said at a press briefing today at NASA's Jet Propulsion Laboratory, Pasadena, Calif. Spherules below the outcrop in the crater apparently weathered out of the outcrop, but Opportunity has also observed plentiful spherules and concentrations of hematite above the outcrop, perhaps weathered out of a higher layer of once-wet deposits. The surrounding plains bear exposed hematite identified from orbit in an area the size of Oklahoma -- the main reason this Meridiani Planum region of Mars was selected as Opportunity's landing site. "Perhaps the whole floor of Meridiani Planum has a residual layer of blueberries," Knoll suggested. "If that's true, one might guess that a much larger volume of outcrop once existed and was stripped away by erosion through time." Opportunity will spend a few more days in its small crater completing a survey of soil sites there, said Bethany Ehlmann, a science team collaborator from Washington University, St. Louis. One goal of the survey is to assess distribution of the spherules farther from the outcrop. After that, Opportunity will drive out of its crater and head for a much larger crater with a thicker outcrop about 750 meters (half a mile) away. Halfway around Mars, NASA's other Mars Exploration Rover, Spirit, has been exploring the rim of the crater nicknamed "Bonneville," which it reached last week. A new color panorama shows "a spectacular view of drift materials on the floor" and other features, said Dr. John Grant, science team member from the National Air and Space Museum in Washington. Controllers used Spirit's wheels to scuff away the crusted surface of a wind drift on the rim for comparison with drift material inside the crater. A faint feature at the horizon of the new panorama is the wall of Gusev Crater, about 80 kilometers (50 miles) away, said JPL's Dr. Albert Haldemann, deputy project scientist. The wall rises about 2.5 kilometers (1.6 miles) above Spirit's current location roughly in the middle of Gusev Crater. It had not been seen in earlier Spirit images because of dust, but the air has been clearing and visibility improving, Haldemann said. Controllers have decided not to send Spirit into Bonneville crater. "We didn't see anything compelling enough to take the risk to go down in there," said JPL's Dr. Mark Adler, mission manager. Instead, after a few more days exploring the rim, Spirit will head toward hills to the east informally named "Columbia Hills," which might have exposures of layers from below or above the region's current surface.